Classic but with an eye for the contemporary, the urbane as well as the natural: this is the essence of Arba. The native wood of the maple is especially oiled to endow it with unique characteristics of high resilience, stability, and exceptional texture. A gradual darkening of the natural products over the years has provided Arba with another attribute: the wood makes the refreshingly cool light of the energy-saving fluorescent lamp glisten and transforms it into a warm yet powerful and comfortable light while bestowing a unique atmosphere to the room. The diffusor used for vertical illumination is made of solid acrylic with highly polished edges to direct an even, glare-free light. 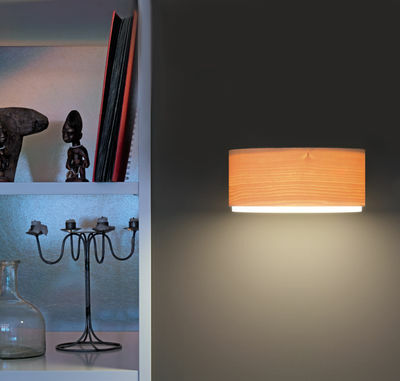 This wall lamp lends a familiar sense of comfort to any hallway and natural warmth to any bedroom reading light.